Visitors have not been allowed inside the torch for over a century after a massive explosion. Ever wonder why visitors aren't allowed inside the Statue of Liberty’s torch? The event that sparked the ban occurred 102 years ago Monday, on July 30, 1916. 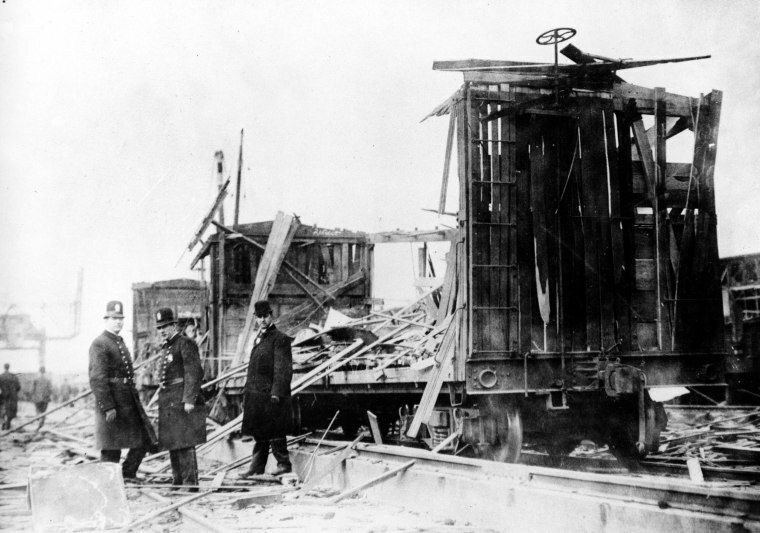 An explosion on Black Tom Island in New York Harbor in the middle of the night could be heard from miles away, shattering glass windows in Manhattan and killing seven people. "It was a terrific explosion — the worst that had ever happened in New York," said Kenneth Jackson, a history professor at Columbia University and one of the country's foremost scholars on New York history. Shrapnel hit the nearby Statue of Liberty, closing off the arm to future visitors, as noted on a commemorative plaque that remains on the site to this day. The National Park Service's Statue of Liberty website cites the Black Tom explosion as the reason the torch is closed off, though it is unclear why, a century later, guests are still not allowed inside. But the legacy of this explosion is deeper than just relegating tourists to Lady Liberty’s crown. Black Tom had been a center for the production of armaments that were being shipped to Europe to aid mainly Britain and France, both of which were fighting Germany, during World War I — though the United States was technically neutral at the time. "The Germans probably saw that as an act of war," Jackson said. The New York Times reported that the explosion was initially attributed to negligence by those working on the island. It took years for investigators to determine that Germany was actually responsible for the explosion, a conclusion that had been written off in the immediate aftermath. It wasn’t until 1939 that $50 million in damages were awarded to plaintiffs in the Black Tom explosion, the largest settlement by an international tribunal. But it took until after World War II for Germany to initiate the payout — prolonging the saga until 1979. According to Chad Millman, who wrote “The Detonators: The Secret Plot to Destroy America and an Epic Hunt for Justice," there were two main reasons that the investigation took so long. First, a lack of documentation made it incredibly difficult to prove Germany was guilty of the crime. Second, for political reasons more than anything, Germany was incredibly reluctant to admit it. "The new German government felt like if they were to admit to and pay damages for the destruction at Black Tom, it was tantamount to saying that they drew the U.S. into war from this," Millman said. "It meant more to Germany to not have them found responsible for Black Tom than it did for the U.S. to prove Germany was responsible for Black Tom. "And it wasn't really until it got into the late 1930s, and there was such animus again towards Germany because of Hitler, that all of the sudden the U.S. just became more interested in the case." Jackson noted that given the massive destructive power of the explosion, it is fortunate that more people were not killed. He said the isolation of the island, along with the decreased influx of immigrants to nearby Ellis Island at the time — other countries were deterring their citizens from leaving and escaping the draft — lowered the casualty count. It also meant fewer people would remember what happened at Black Tom. "Black Tom is certainly not well known, even in the New York area," Jackson said. "I think partly because of the isolation of the explosion. Most people had never heard of that island, they don't even know where it is."